As a curator, I have the duty to take care of the exhibit, grow the collection, but also perform research. This last duty includes participating in scientific conferences, and giving talks or present posters. Every four years, there is a Musem & Mineralogy conference, where curators, collection managers, and museum people in general meet, talk about their research, collections, and exhibits. 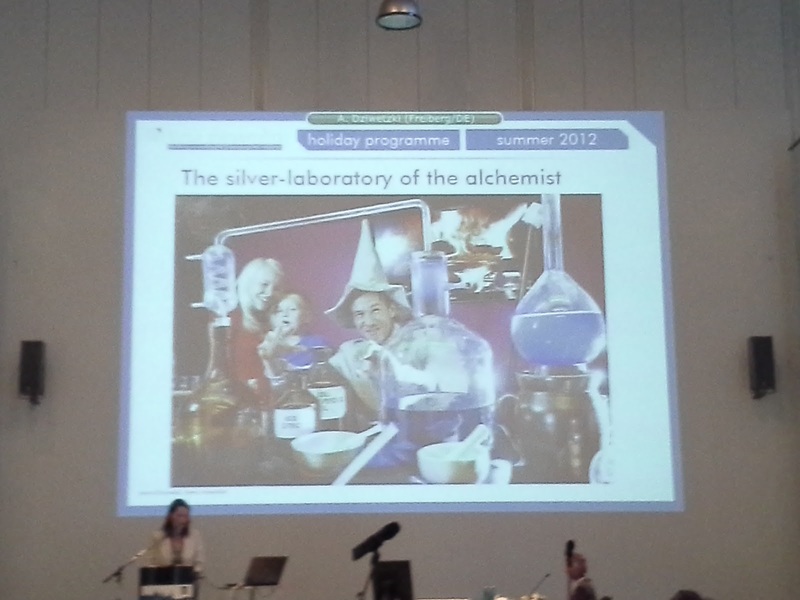 This year, the conference was organized in Dresden, Germany. Dr. Tony Kampf and myself (Eloïse Gaillou) traveled across the Atlantic to attend the conference. This trip gave us a great chance to discover the magnificent town of Dresden, which had been bombed at the end of the World War II by the Americans, and is still under construction. Most of the downtown has been rebuilt to its former look, and its beauty has been brought back. 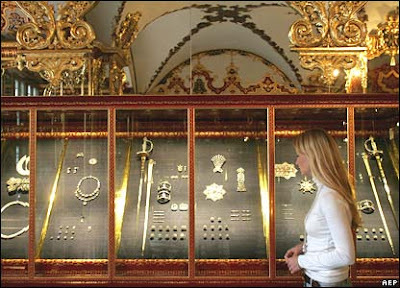 The tour also included visits to several mineral collections, and a tour of the Green Vault where the famous Dresden Green Diamond (among all the other crown jewels) are displayed. Click to read more about the Dresden Conference! 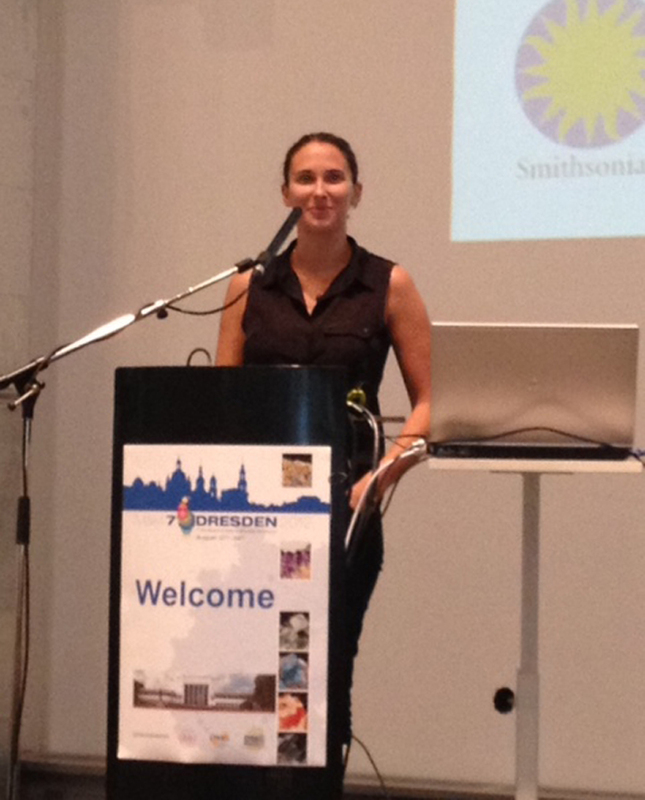 Our colleagues from Dresden organized this conference, attended by about 150 curators and collection managers. 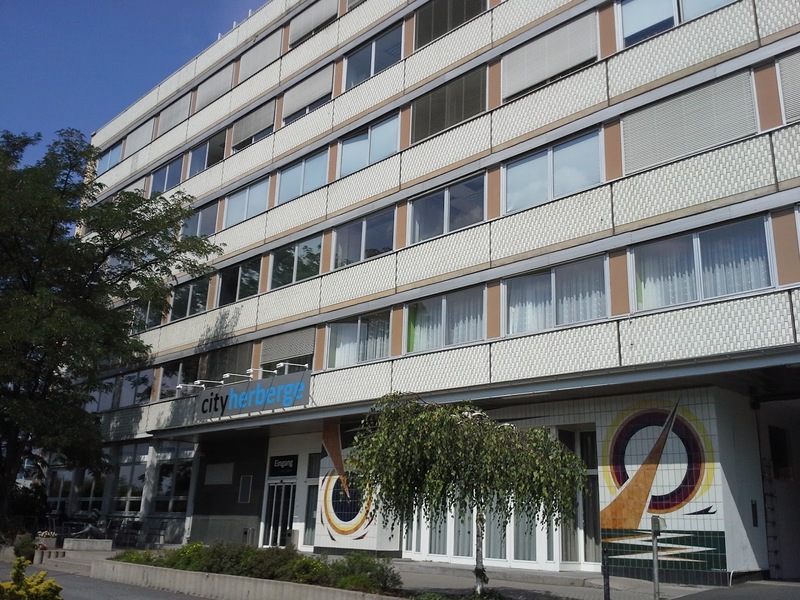 They welcomed us at the Museum für Mineralogie und Geologie, recently transferred from downtown to a suburb campus, with new facilities and great storage space. The conference chair, Dr. Klaus Thalheim, giving the opening speech. The slice rock collection at the Museum für Mineralogie und Geologie. Beautiful orbicular granite from Finland. View of the Hall of the Museum. Do you recognize these specimens? Well, look below! Amazing old mineralogy books / catalogs (above, from 1763, below, 1868). Famous violet apatite from Germany. The collection also includes fossils. 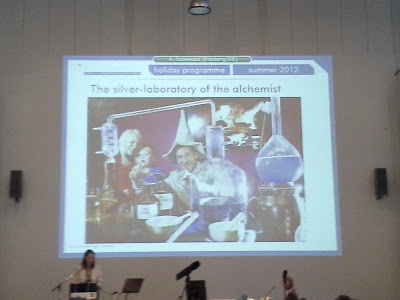 Monday August 27, 2012: Research talks, visit of the Green Vault & touring Dresden. Tony almost opened the conference with his talk on Pseudotypes, and I gave a talk soon after on Australian and Venezuelan pink diamonds. Jeff Post, the curator of the Smithsonian Institution, also presented our work on Blue Diamonds. A total of 3 talks were given on diamonds, and many other talks focused on mineralogy, new minerals and nomenclature. A tour of the Green Vault was organized by the conference. Unfortunately, most museums in Dresden don't allow pictures! So here are a few from other sources. One of the rooms in the Green Vault. All the treasures of this vault was amassed by August the Strong in the 18th century (copyright: Getty images). The crown jewels of August the Strong, on display in the Green Vault (copyright: BBC news). 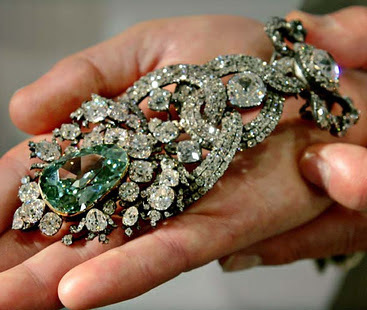 The Dresden Green, the biggest green diamond to date (40.70ct). The images don't do it justice: the color is magnificent, with a lot of blue overtones. One of the best and intriguing diamond I have seen so far... along with the Hope and the Blue Heart diamonds (copyright: pricescope). Another picture of the Dresden Green in its setting (copyright: Famous Diamonds). Many other unbelievable pieces of jewelry, art, and sculptures are on display, numbering hundreds of thousands of gems and pearls. Touring Dresden in the evening. Dresden is split by the Elbe river, with on its South side the old town, and North the new city. The touring I did was by foot, in the beautiful old town. The entrance of the Green Vault. The girls from the Smithsonian and the Harvard museums. 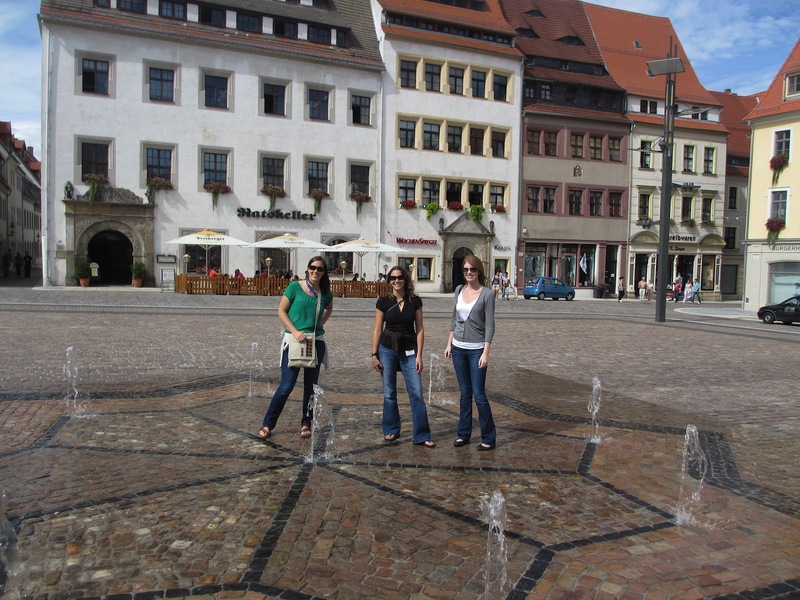 And plenty of random pictures of downtown Dresden! After a good day of talks and tours, beer with friends / colleagues is required! The entire group had an organized tour of Freiberg, which included a visit to the Cathedral and two collections: the Technische Universtät mineral collection and Terra Mineralia. The entrance of the gallery. Overview of the mineral collection. 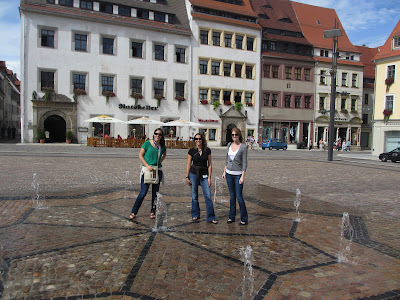 Freiberg: the silver town. 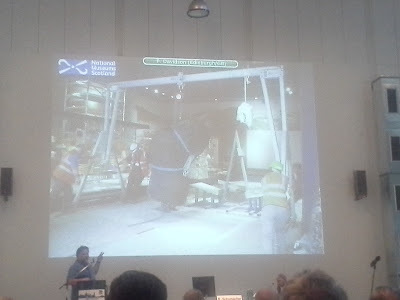 The Freiberg silver deposits are still mined now. From left to right: Smithsonian, LA county, Harvard museums. The entire Terra Mineralia collection is a gift from Erika Pohl-Ströher to the Bergakademie. 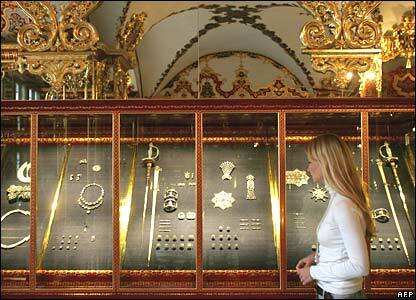 It is displayed in the Freiberg castle, that has been completely remodeled to welcome this collection. 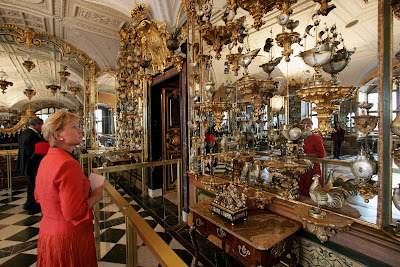 Each room is assigned to a different continent, except for the Treasury room. Malachite, Democratic Republic of Congo. Copper from Kazakhstan... one of my favorite. Cerussite twin on anglesite, Morocco. Wulfenite, Mexico. Another favorite... Amazing crystal habit. Last day of the conference. Many talks about collection preservation and redesigning an exhibit. Really interesting! 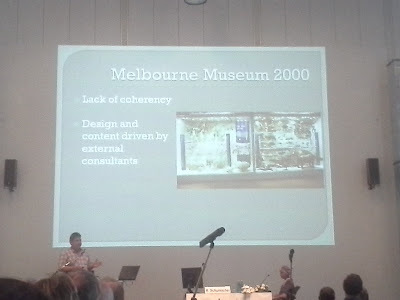 Melbourne museum: re-design in 2000. 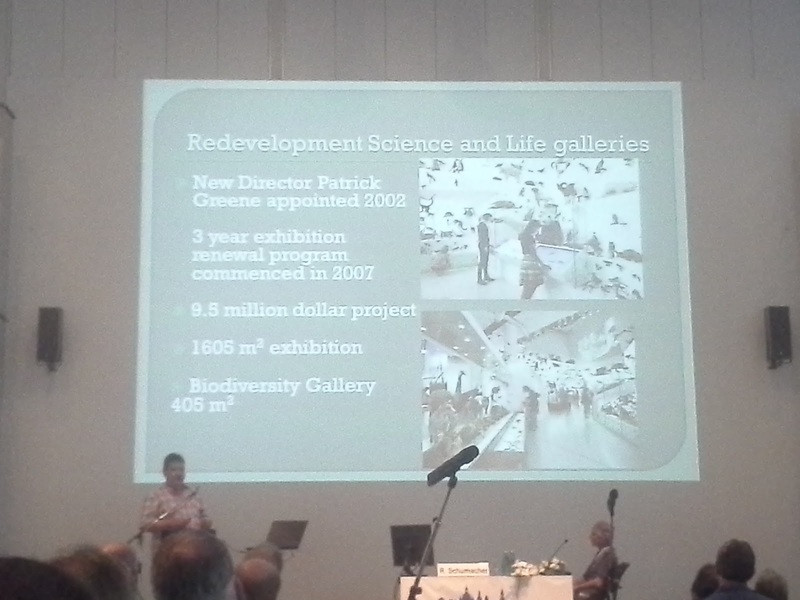 Melbourne Museum: re-design in 2008: soooo much better! Terra Mineralia: focus on educational programs. A few pictures of the town, before leaving the day after. ... and a last beer for the road! Our hotel should not be missed: the CityHerberge. Beautiful pictures. Hoping to see the jewels the green vault soon. Thanks Janet! Unfortunately, no pictures allowed in the Green Vaults... Dresden is beautiful, you will have a great time. And if you are into minerals, you should go to Freiberg to see Terra Mineralia, it's really worth it!